One of my favorite summertime fruits is the strawberry! 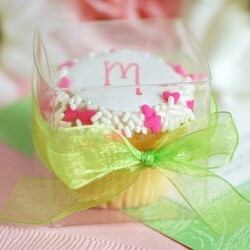 They’re sweet and perfect and can be used in so many ways, even on a wedding cake! 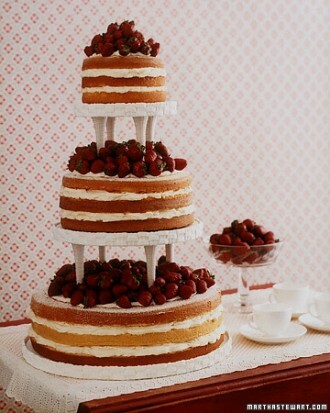 I love strawberry shortcake and today’s naked wedding cake reminds of that sweet treat. We’ve all been there – at the outdoor summer wedding and it’s hot and we’re thirsty and we realize we forgot our bottle of water at home. There’s something to be said for a traditional white wedding cake. While I do love the non-traditional, oddly shaped, bright colored cakes that I often feature here sometimes it is nice to just find a lovely white wedding cake. 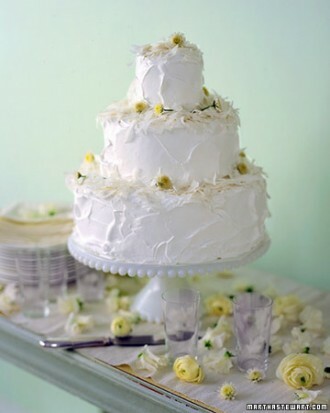 This four tier cake is simple and elegant and practically perfect in every way. There’s nothing boring about it either. The tiers are are iced with traditional butter cream icing. 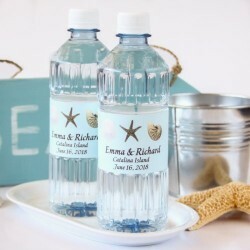 But instead of leaving them plain the icing is decorated with Swiss dots and diamonds that were piped onto the icing – giving it just the right amount of elegance and pop! 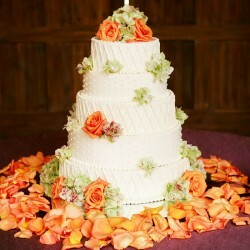 To add even more to the cake – without going overboard – fresh flowers are used to adorn the cake. This is a fun idea because you can use any flower you like. Smaller buds would be ideal for the cake but larger blooms would work for the cake topper. And, a traditional white cake is perfect in any season. You can find this cake here. Despite the cooler-than-normal temperatures that won’t let go, it is officially spring! 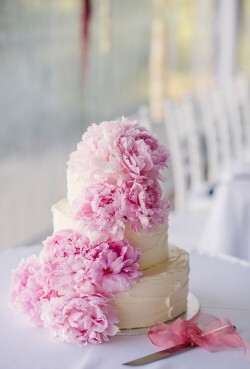 And that means fresh flowers are on my mind, especially when it comes to wedding cakes. I love seeing wedding cakes with fresh flowers – they give the cake a nice pop of color while keeping things elegant and classy. Plus, it’s a good way to incorporate your bouquet flowers into the reception. It’s no secret that I’m a big fan of edible wedding favors, and that’s especially true when we’re talking about mini cupcakes. Sure, a full-size cupcake is awesome…but when you’re serving wedding cake to your guests it’s probably a better idea to think about mini cupcakes if you’re going with an edible favor. When I’m looking for wedding cakes to share with you I’m always searching for that one cake that stops me in mid-scroll. That cake that wows me from my computer screen. And today that cake is this one with the pretty pink flowers. 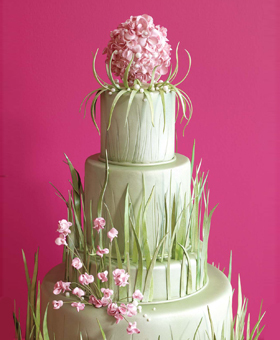 As we inch closer and closer to spring and the much-anticipated blooming of springtime I flowers I just had to find a cake that had lovely blooms as part of the decorating. Tomorrow we’ll all be celebrating St. Patrick’s Day and the wearing o’ the green, so today seemed like a good day to showcase a cake with little green shamrocks! I’m a sucker for magnets. I buy at least one new magnet on every family vacation and you can barely see the front (or sides) of my refrigerator because it’s covered in magnets. So when I saw these “love” keyboard magnets I just had to share them with you! You ever have one of those days when you are craving chocolate? Happens to me every day and today I decided to do something about it – I found the perfect one-tier chocolate wedding cake just for you! 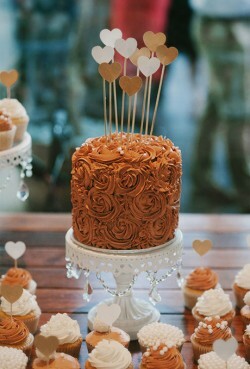 I love the idea of serving a wedding cake iced with decadent chocolate icing. Why? Because your guests won’t be expecting it. They’ll be waiting for a cake with white icing and some pretty embellishments. But chocolate cake? That’ll keep your guests talking about your wedding for a very long time! And this one-tier cake is so pretty! The chocolate icing looks like roses and the gold and silver hearts as cake toppers adds that perfect amount of whimsy to the cake. Of course, it is just a one-tier cake so it might be enough for you and your new spouse. 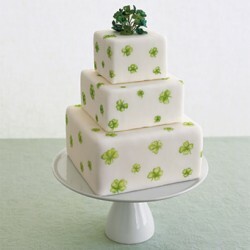 I think this cake would be ideal as the cake you cut and then you could serve a bigger wedding cake (or even cupcakes!) to your guests. You can find this cake here. It was created by Tealicious House. The great spring thaw of 2015 is happening right now in the northern half of the country and we’re slowly starting to see hints of green(ish) grass under the melting snow!